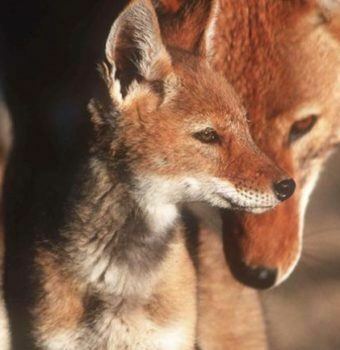 The Ethiopian wolf is Africa’s most endangered carnivore. In the Ethiopian highlands rapid changes from a growing human population create complex challenges for Ethiopian wolves. Safeguarding habitats for the benefit of wildlife and people is the vision of EWCP. The Ethiopian wolf is Africa’s most endangered carnivore and the world’s rarest canid. With fascinating social lives, distinctive red coats, and fragile status, Ethiopian wolves motivate conservationists, scientists, and supporters from around the world to save them from extinction. Ethiopia currently has the fastest growing human population in Africa. In the Ethiopian highlands these rapid changes create complex challenges for the wolves and other fascinating endemic species. As subsistence agriculture encroaches higher and deeper into the highlands, wildlife become increasingly trapped in mountain tops. These Afroalpine islands in a sea of people are precious land for local communities which, together with their sheep and goats, bring domestic dogs that carry fatal diseases for the wolves. As specialized rodent hunters, Ethiopian wolves do not pose direct threats to people, yet ensuring their coexistence with people is not a simple task. 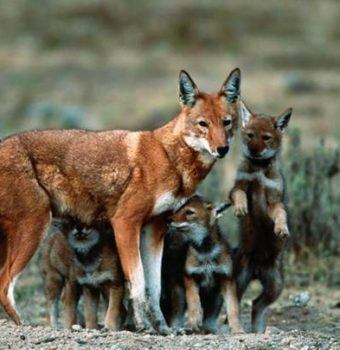 Safeguarding the future of natural habitats for the benefit of wildlife and people in the highlands of Ethiopia is the vision of the Ethiopian Wolf Conservation Program (EWCP). Thanks to EWCP’s long-term commitment there are today more than 60 Ethiopians working to tackle these problems from many angles, working alongside local communities, government institutions, and international partners. Spread the Word! Connect with EWCP on Social Media. EWCP is saving the rare Ethiopian wolf from extinction. Ethiopian wolves are vulnerable to diseases spread by domestic dogs living around wolf habitat, EWCP fights this by administering vaccines to the wolves. Jorgelina Marino explains this work in this video by TV network HITN. Peering into the Ethiopian wolf’s intimate social life allows you to recognize very subtle behaviors, until you can anticipate their next move. It is the same level of knowledge and understanding as in human relationships when you know someone well enough to guess what they will do next. Dr. Claudio Sillero grew up on a cattle ranch in Argentina surrounded by animals, which shaped his desire to dedicate his life to working with them, especially with Africa’s large carnivores. 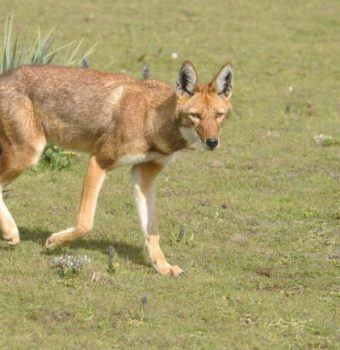 In 1985 he enrolled in a Masters program in Nairobi and while in Kenya was offered a job in Ethiopia, to study the rare Ethiopian wolf, a species he had to look up in a book because he had never heard of them before. What began as a research project turned into a lifelong career, and in 1995, he founded EWCP with the goal of conserving the Ethiopian wolf. Hailing from the same town as Claudio, Dr. Jorgelina Marino, works alongside Claudio to ensure a secure future for Ethiopian wolves. Jorgelina studied biology in the Patagonian Andes and made her way to Ethiopia in 1997. There, captivated by the mountains, the people, and the wolves, she surveyed every remnant wolf population and explored new frontiers of research, discovering what made Ethiopian wolf populations tick and how families carved out and defended their territories. 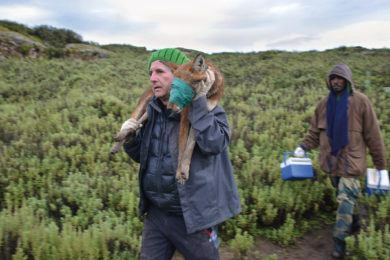 In the Bale Mountains, Jorgelina and Claudio raised their family and this project, which expanded from a small group of 8 people in 1997 to more than 60 employees today, with new offices in four other mountains—all of which are a result of Jorgelina’s determination to not give up on any of the surviving wolf populations, no matter how small or remote. EWCP believes in a future where people and wildlife can coexist peacefully. EWCP’s contribution to building biodiversity friendly futures includes supporting new protected areas to realize their conservation goals, and creating opportunities for local communities to have more sustainable livelihoods in the highlands of Ethiopia via innovative approaches, such as microenterprises for production and commercialization of fuel-saving stoves, and highland honey and “guassa” grassland gardens. Managing diseases, with benefits for people, wildlife, and domestic stock. Many Ethiopian wolves have been killed by rabies and canine distemper after coming in contact with domestic dogs. Livestock and people are also affected. EWCP continues to vaccinate thousands of dogs every year to prevent future disease outbreaks. They also continue to vaccinate the wolves themselves as a rapid response to the disease outbreaks. EWCP is now ready to implement large-scale, preventive oral vaccination campaigns across the wolf range. In a global world, the risk of diseases to people and wildlife requires a holistic approach. EWCP embraces a One Health vision working with many partners and sectors, and conducting cutting-edge research. The success of species conservation relies on a deep understanding of the intricacies of behavior and ecology. 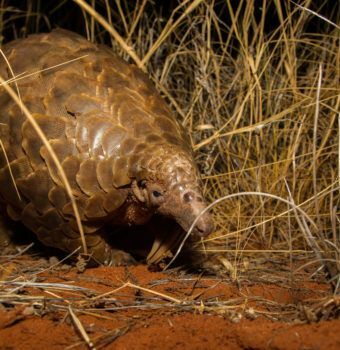 With 30 years of monitoring and research experience, EWCP is best positioned to lead on evidence-based conservation and monitor the fate of its conservation interventions. A team of passionate wolf monitors follows the lives of more than 60 wolf packs in five populations, together with a network of Wolf Ambassadors from the local communities, who are EWCP’s eyes and ears in the most remote corners of the Afroalpine. EWCP believes in the role of science in conservation and supports Ethiopians who want to further their academic careers. EWCP’s latest scientific achievement was the trial of an oral rabies vaccine that may hold the key for the survival of the species. All five extant Ethiopian wolf populations remain in danger of extinction simply due to their small size. These facts are scary: the largest population has some 300 wolves and the smallest fewer than 25; two small wolf populations went extinct in the past 10 years; there are no wolves in captivity anywhere in the world. The long-term survival of these wolves may ultimately depend on assisted movement of animals; for example to rescue populations decimated by disease and to recreate new ones in areas occupied by wolves in the past. 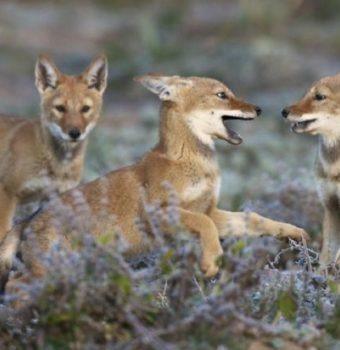 EWCP is prepared to respond to urgent needs with drastic action, and is taking the first steps of a vision for the active management of Ethiopian wolves to secure their survival. 60 Fill 1 Created with Sketch. 4,000 Fill 1 Created with Sketch. 150 Fill 1 Created with Sketch. 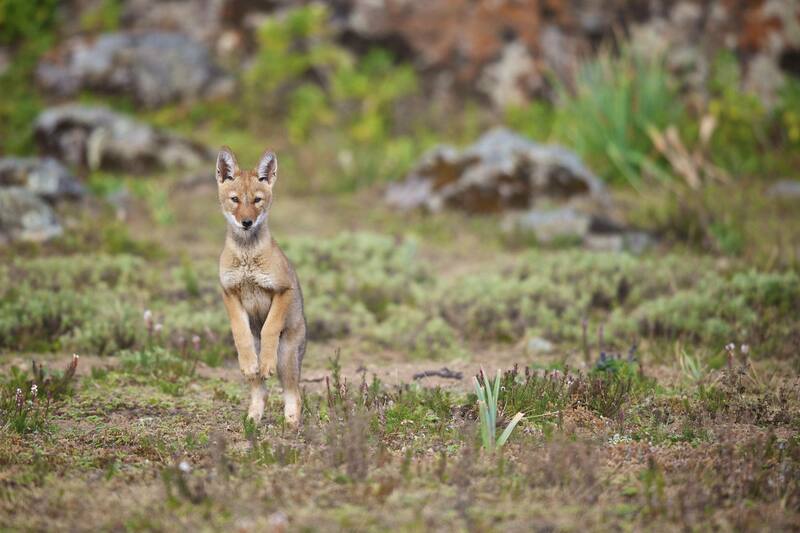 $500 helps local school children understand the Ethiopian wolf through class visits, Nature Clubs, and printed environmental education materials. $1,800 vaccinates 250 domestic dogs living near the Ethiopian wolf against rabies, preventing the spread of this disease to the wolves. A donation of any amount can help care for the EWCP team of horses, the best mode of transportation in the Ethiopian highlands. 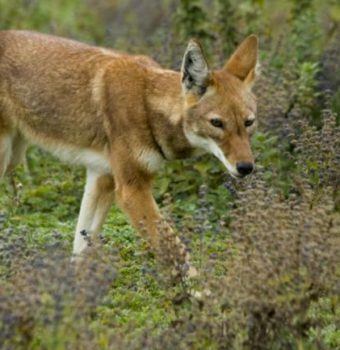 The Ethiopian Wolf Conservation Program (EWCP) has played an instrumental role in helping the Ethiopian people learn about and protect the rare Ethiopian wolf, an animal that lives only in their country, including working with the Ethiopian government in creating a plan to protect them.